Blue Sky BuildersSkywriters Garage BlogBlue Sky BuildersShould My Garage Have One Double or Two Single Garage Doors? When you want to upgrade the look and functionality of your garage, several of the most important decisions you must make involve the garage doors. Some decisions will significantly impact your property’s curb appeal, such as the color and decorative style of the doors. Other decisions are more functional, such as the insulating value and the type of electric garage door opener you install. 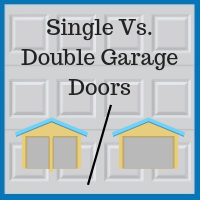 But the most long-lasting decision you will make is this: should you design your garage for one double garage door or two single doors? Many people assume that one double garage door will be cheaper than two single-car doors, and this is true primarily because of the cost of the extra garage door opener. However, given that a garage door opener only costs about $500 with installation, this is a relatively small percentage of your overall garage cost. If you have a full-size truck or SUV in your family, you may find it easier to drive into and back out of a double-wide door. If you are planning a three-stall garage, the most common solution is to install one double-door and one single door. Installing a double door makes it easy to park one vehicle in the middle of the space, leaving plenty of room for loading, cleaning, and repair tasks around all sides of the vehicle. This can be especially helpful if you have a family member who uses a wheelchair. The double-wide opening also makes it more convenient to work on a vehicle, boat, or a large carpentry project in the garage. If you simply prefer the look of two single doors, you can find styles that look like two separate doors. If you think your only option is one 16-foot wide door or two 8-foot wide doors, think again. 9-foot and 10-foot wide doors are also available. Many people find the appearance of two single garage doors to be more attractive and upscale than one large double door. When you have to park two cars inside one double door, you are forced to park fairly close together. By having two separate doors, you can choose how far apart to space the doors, allowing for extra room between vehicles so you can fully open the doors on each side. You can choose how much or how little air you want blowing into the garage by opening just one door. If the spring on a single garage door fails, you can generally get your vehicles out through the other door. If the spring on a double door fails, both of your vehicles will be trapped inside until you can get a repairman out. Springs generally wear out every eight years. When you are ready to talk about upgrading your DuPage County garage, call Blue Sky Builders in Downers Grove. 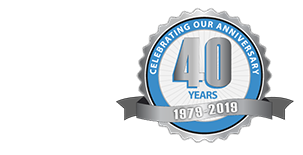 We can tear down an old garage and replace it with a new one, or we can repair or renovate your existing garage. Call us at 630-852-8485 for a free estimate.